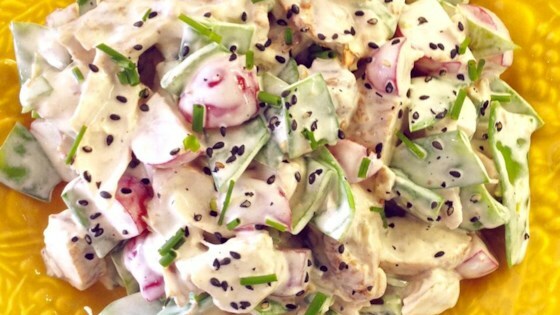 "The best chicken salad you may ever eat. Serve with crackers or on bread for a sandwich." Whisk together the mayonnaise, yogurt, ginger, lime rind, salt and pepper. In a mixing bowl, combine the snow peas, chicken, onion and water chestnuts. Pour dressing over salad and mix gently. Cover and refrigerate until chilled. I didn't have vanilla yogurt nor a lime, so I substituted lime yogurt instead and it was delicious. Was Ok. One would think with the snappy ingredients that the flavor would be more bold. Might need more ginger/lime, etc. Very Good! I used the dressing from another salad in Allrecipes, Sesame Pasta Chicken Salad. It is a sweet and sour type dressing. I will definitely fix this again. Served to friends for lunch on lettuce along with Panzanella (tomato) Salad from allrecipes.com Big hit. Easy and nutritious.